Landscaping tips can help when used as part of protecting your foundation in the Dallas, Fort Worth, TX area. Why is it important to maintain your foundation? Because if you have a good drainage systems that can stop problems, you may be able to avoid having foundation repair. Contact us with questions. Below are some solid suggestions that can help alleviate the need for foundation work and protect your foundation. It’s important to stop foundation issues that could necessitate repairs on your Dallas, Fort Worth area house. Landscape Every Side Of Your Foundation To Protect It From Damage. It’s as important to landscape the sides and back of your property as it is to landscape the front. If only one part of the yard is landscaped, soil on that side will generally expand because it’s likely to be watered more often. Soil expansion can lead to foundation cracks so it’s best to water your property uniformly. Because the expansive clay soil in the Dallas, Fort Worth area affects landscaping and you’ll want to protect your foundation from issues such as large increases in moisture or too little water. Landscaping should be done around your founding using deep rooted plants because shallow rooted plants could erode over a short period of time. Foundation repairs can largely be avoided by following simple landscaping tips like these. Make Sure Flower Beds Slope Away From The Foundation. Follow this good tip: Check the grade on your Dallas, Fort Worth property and landscaping to make sure water can’t puddle around your house. Experts generally recommend having a 9-10” drop for the first ten feet around your home to keep moisture from accumulating under your foundation. By taking this step, you may be able to avoid having foundation repair service. It’s a tip worth following in all cities, including Grand Prairie, Mansfield, Arlington, Garland, Colleyville other areas. This equates to a slope of approximately 3-5% away from your foundation. Fill embankments should not be steeper than a two to one slope ratio, with the horizontal slope being a two and the vertical ratio being a one. Without a proper slope, your foundation will experience erosion. 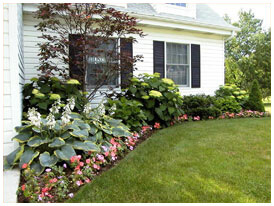 To Avoid Foundation Repair, Thoroughly Mulch Your Flower Beds. 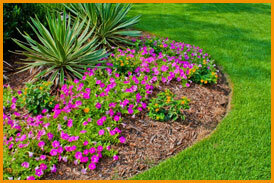 How can mulching flower beds prevent foundation problems? Mulch retains moisture and will be beneficial to your plants and your foundation in the hot months by preventing the soil around your property from becoming excessively dry. Remember, exceedingly dry soil can harm your foundation by causing movement. Install Drainage Systems To Stop Foundation Issues. When placing plants in flowerbeds near your foundation, make sure to create drainage spaces that will allow water to flow out of flower beds and downhill. For example, if you’re using bricks as a flowerbed border, make sure to leave a little space between the bricks. Positive drainage that allows for surface runoff is critical to minimizing foundation failure. There are many types of landscape drainage problems that can be solved with drainage systems like French drains. Some of them include flooding, erosion, negative drainage, seepage, and sedimentation. Moisture seeping into your concrete can cause corrosion and expansion of the steel rebar. Over time, this could lead to foundation failure. 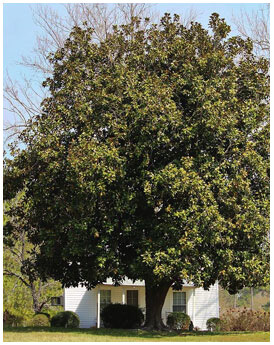 When Landscaping Around Foundations, Position Large Trees Away From Your Foundation. To be on the safe side, don’t plant trees closer than 20’ to your foundation. Keep in mind that roots commonly extend from the tree trunk by as much as one to two times the height of the tree. Some trees, such as spruce trees, grow particularly large far reaching roots, and should be planted 30’ away from your house. When used for landscaping around foundation in the Dallas, Fort Worth area, trees and shrubs often get very large. That’s because tree roots rob your foundation of moisture (this process is called “transpiration.”) Trees that are positioned near your house should be watered a minimum of twice a week during the hot summer months and more often, if needed. If a tree near your home is mature and you cannot remove it, another option is to install a root barrier. Root barriers can be installed 3-5’ deep to redirect tree roots away from your house.Your foundation should not be completely covered by foliage. As a general rule of thumb, approximately 3-5” of your foundation should be visible. Be sure to plant shrubs that are 6’ tall or more approximately 4.5′-5’ away from your foundation. It’s a tip that used when landscaping in the Dallas, Fort Worth area a lot. 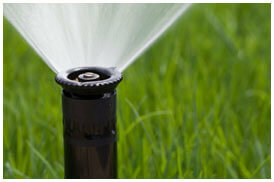 Use A Soaker Hose Or Install A Sprinkler System. Contact Us With Concerns. Its hot in North Texas. When landscaping your yard, follow this tip to protect your foundation and avoid the need to repair your foundation: Install a sprinkler system that can also water your foundation in summer? Temperatures in this area often exceed 100 degrees. Because excessively dry soil around your foundation can harm it, plan ahead to protect you Dallas, Fort Worth structure and make sure it doesn’t get dry. This system will be particularly valuable in times of extreme Texas droughts and can help minimize cracks. Of course, drainage systems are effective for the opposite problem. If you can’t install a sprinkler system, run a soaker hose around your foundation, keeping it approximately 2′ away from your structure. Watering 15 minutes a day, three to five times a week in the summer, can minimize foundation cracks and other problems. If you need assistance, just contact us online today for foundation repair estimates.